Enjoy the Comfort of our Airport Hub Hotel only 500 Yards from Glasgow Airport. There is a Free Shuttle Bus to and from the Airport (Please Check Operating Hours)108 Rooms - Separate Desk - Satellite Television - Pay to View Movies - Direct Dial Phone - Non Smoking Rms Available - 4 Conference Rms for up to 25 Guests - 6 Summit Studios - Guest Parking for 170 CarsExperience great Italian Cuisine in the Bagio Restaurant Open Daily. Relax with a Drink in the Hotel Bar. 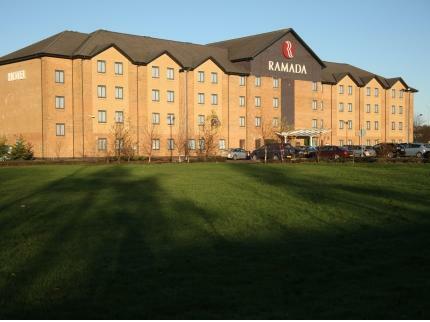 Airport stopover Packages Available Including 8 and 15 Day Car Parking, Subject to Charge.The Hotel now Operates a Non Smoking Policy in all Public Places.All Ramada Jarvis Hotels offer a Media Package in all rooms. This package includes High Speed Internet Access and 24 Hour movies. This is payable at the hotel or complimentary in Executive DL2 Rooms.Please Find Our Childrens Policy. A Child Is Between 4 and 15. Under 4, No Charge. Children Sharing Adults Room Pay For Food As Taken. Children In Their Own Room Pay 50% Of The Adult Rate. Midweek - The Same Rules Apply With Adult Paying Single Supp If Applicable. Extra Bed and Cot on Request Basis only.